Choosing to eat out on a whim is a bit risky. Who’s to say the menu bears any resemblance to what they put on the plates? To borrow from a recent episode of ‘Come Dine With Me’, who’s to say the only exotic element of an ‘exotic’ salad won’t be the fact that the chef preparing it was born in the Caribbean? Worse yet, who’s to say you won’t order a bottle of wine recommended by the owner only to find out, after you’d swilled two bottles of it, that it costs $75 a bottle – a personal experience that still brings a tear to my eye. 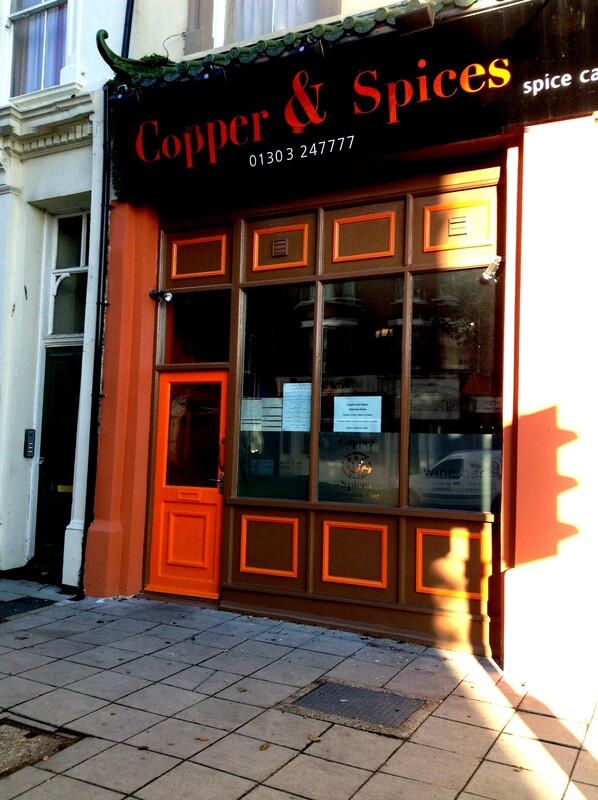 Copper and Spices in Folkestone only opened about two weeks ago. This is the second venture for these folks who already have a sister restaurant in Dublin, but they obviously couldn’t resist the charm of Folkestone and decided to set up shop on Bouverie Road West. It’s a mere 10 minutes’ walk from our house and on my route to work, so I had watched the transformation over the last couple of weeks. By this point, the paint was dry and the pictures were hung, people were eating and enjoying themselves and we were immediately glad we came. 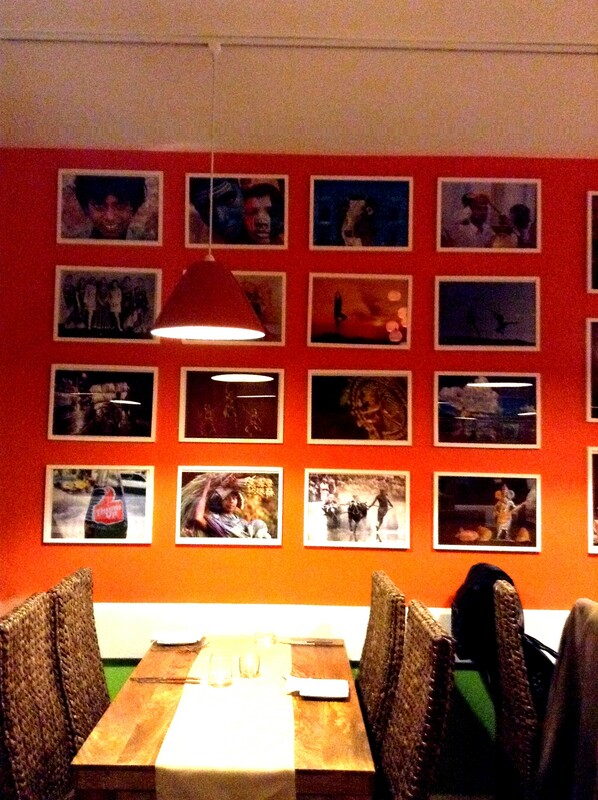 The bright orange walls are hung with colorful pictures illustrating the playfulness of Indian life and they make a great statement as you walk into the dining room – this is not your typical Indian restaurant. The menu backs this up with modern takes on the traditional dishes and new, inventive combinations you won’t have seen before. Loving as we do small plates, we went for a selection of starters for a broad taste of what Chef Saurabh was offering. First up was prawns with ginger, green chillies and hot soya. 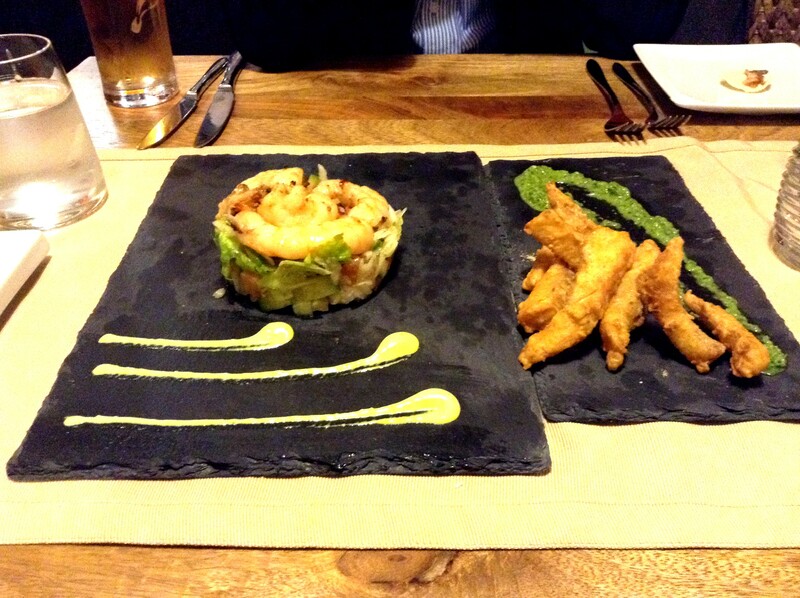 The prawns were tender and juicy and the turmeric and chilli mayonnaise was delicious. As was the case with everything we ordered, the presentation was beautiful and modern with vibrant colors popping off the plates. We also had the Amritsari Macchi, fingers of fish in a chickpea flour batter with ginger, garlic, chillies and carom seeds. It was served with a sauce which was just bursting with freshness. Mint, cilantro (coriander), pomegranate seeds and green mango offered a delicious sweet and sour note and lifted the deep fried fish perfectly. 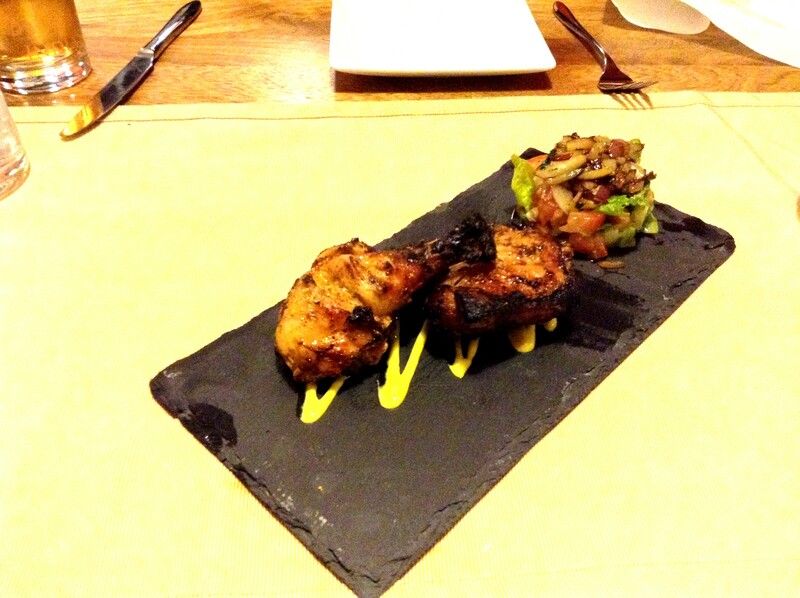 Next we had the Murgi ki Tang which was pretty much the best barbecued chicken ever. The spices on the chicken were very subtle, but the meat was so succulent with lovely bits of char for crunch and the turmeric and chilli mayonnaise again was fantastic. Then the star of the evening, a deboned leg of lamb cut into chunks and marinated in jaggery, which is a sugary liquid made by pressing sugar cane. 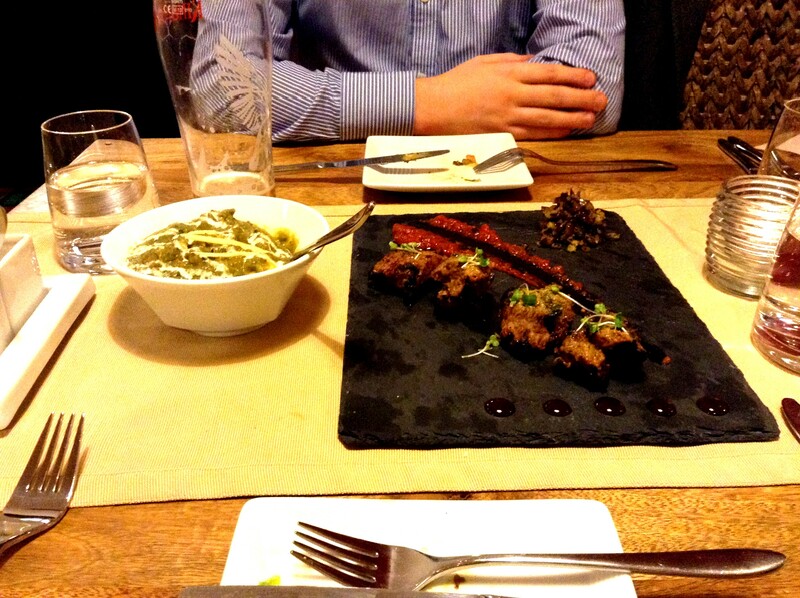 The lamb was tender and deliciously flavored with papaya, ginger, garlic, green chillies and fenugreek. The lamb was served with a tomato chutney and caramelized red onions. We had this with a side of saag paneer which wasn’t just any old spinach. It was made with broccoli, mixed greens and beets which gave it a deep earthy flavor. 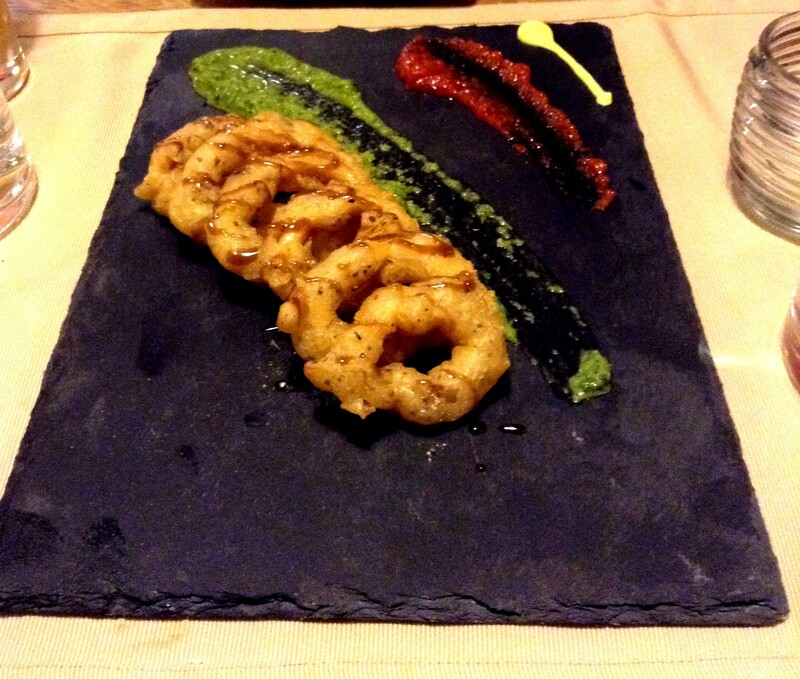 As they’ve only just opened, they are still working on the menu and are road testing recipes as they go, so we got these complimentary squid rings which were in a chickpea flour and chilli batter. Since our visit I have seen some great stuff on their Twitter and Facebook page, so they’re definitely working hard and I’m looking forward to seeing what they come up with. The table next to us was full of oohs and ahs too. They raved about the chickpeas cooked in tea and the Kerala fish curry which is made with tilapia and is on my must-try list for next time. They also really enjoyed the wines they had, which is good because it’s not only a restaurant but a wine bar as well. 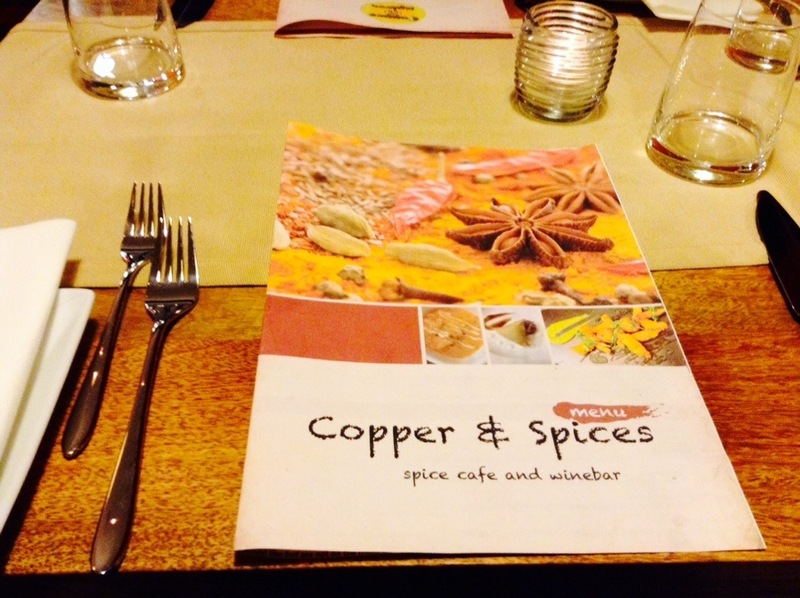 We had such a lovely experience, it’s so great to have a good restaurant so close to our house. The prices are very reasonable and the interior makes you feel like you’re having a nice meal out, not like you’re grabbing a quick curry after a night on the ale. If you’re wondering what to do with your weekend, come give it a try. I think you’ll be pleasantly surprised. How lucky to you are to have found such a treasure so close to home! Everything looks wonderful! We’re really happy because the restaurants in Folkestone tend to be affordable and not very good or alright but expensive. This is good and affordable! Excellent, I hope you have a really good experience! Keep it Kentish! Looks like a great find. We had the same pleasure last night of finding a new restaurant that we will definitely try agin. It is a great feeling knowing there’s someplace you want to go back to!